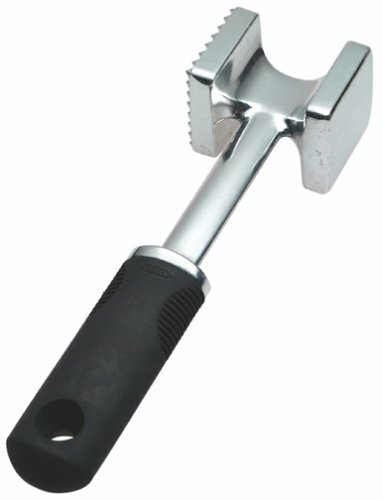 The Good Grips Meat Tenderizer is perfect for taking care of your meat and creating the most tender cuts. It features a flat side for pounding and a textured side for tenderizing. The solid aluminum construction is extra sturdy and soft handle absorbs pressure. Not recommended for use in dishwasher. Cant put in Dishwasher! Heads up! I got this meat tenderizer today and as always oxo has made a great product however I must admit I was a little dissapointed that it CANNOT BE PUT INTO THE DISHWASHER. The dishwasher is a staple in my everyday life... I clean everything with it...and its a bummer I cant put the tenderizer in it too... oh well... its still a well made product. This OXO item is rock solid! Worth the money, and definitly does tenderize meat. Item shipped exactly as described! great tool for it's intended use, unless you have other plans! Let us be clear, if you're going to take the time to cook in your kitchen, you know a few items must need cleaning afterwards, right? Some more than others. For all those people complaining about this tool not being able to withstand the rigors that a dishwasher can dish out, here's a novel idea straight from the confines of common sense. We've all seen the little, brightly-colored spray bottles in bins at grocery stores, mega-stores and such. Fill one with half and half water and bleach, have it within reach . . . that is, just at about ankle level below the sink your standing at, spray the item to be washed and sanitized to your satisfaction (be liberal if you choose to) and then rest assured you've done everything possible under the sun to have your tight little niche of the world as "restaurant-clean and safe" as any four or five star eatery closely managed by astute folks not wanting to lose their job because of some health department oversight on their part. It's not that we are too lazy to get there, it's just that it's been such a long day with bending and such. And the heat in the kitchen, oh my! Next topic, please! I used this for several years, and it is fine for what it is. I like the handle, but the head is a bit small, which can tear the meat.